I know I keep saying this, but this was really a light reading week. I didn’t even have weekend time to read, since I was camping. Yet, I don’t want to miss a week… so here goes nothing! Check out the other It's Monday posts at Teach Mentor Texts. Link up with us and add to all of our "Must Read" lists! This was my favorite part of the weekly reading. I enjoyed the other George O’Connor books, but this week I got my hands on Hera and Hades. I’d read Hera before, but Hades was completely new to me. Hera: George O’Connor says that Hera is his favorite Greek deity, and he devoted this graphic novel to her as a “reclamation project”. I was annoyed on my first read through last year, though. So much of the book is devoted to Heracles instead of Hera, and that didn’t appeal to me. Yet on this read through I saw more of Hera’s saucy nature and I liked it. It also helped that he does the same thing for the Hades book (focusing heavily on Persephone instead of Hades all the time). Hades: I have a new favorite O'Connor, and Hades is it. Hades is a misunderstood god in the Pantheon. I've always felt sorry for him, since most versions of the tale have poor Hades being stuck with his realm. Who wouldn't be angry and brooding if they were stuck living underground for their entire immortal life? No one loves him. Everyone fears him. O'Connor does a remarkable job with this enigmatic man. What made it my absolute favorite, though, is his treatment of Persephone. Persephone shines as the overprotected daughter of Demeter who breaks free and transforms into a woman. I adore this story, and O'Connor handled it - and her - just perfectly. This is a must read. I embarked on my second audio book – Bud, Not Buddy by Christopher Paul Curtis. I love it so far. The author narrates it, and I adore the sound of his voice. Fake Mustache by Tom Angleberger. Oh, I’m a total Angleberger fangirl. 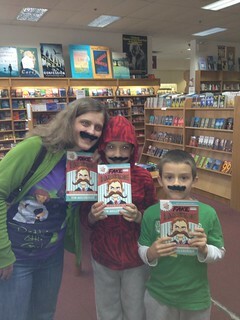 My sons and I preordered our copies of the book, and we arrived at the book store IN fake mustaches to pick them up. The book is a complete hoot. I blew through it quickly, because my students had already created a 10 person wait list as soon as they heard I had preordered it. Fun, funny, and hysterical. With short chapters to entice even reluctant readers, this is a great one for the shelves of upper elementary and middle school. Kathy of The Brain Lair (@thebrainlair) and I are reading Graceling. We finished reading the second portion of the book, and I loved it even more than the start. We’ll have our thoughts up later this week. I didn’t get to read over the weekend that started my spring break, but I’m going to make up for lost time. I started Neversink last night. I plan to work on several others in my book pile, as well as catch up on a ton of comics I have waiting for my love.